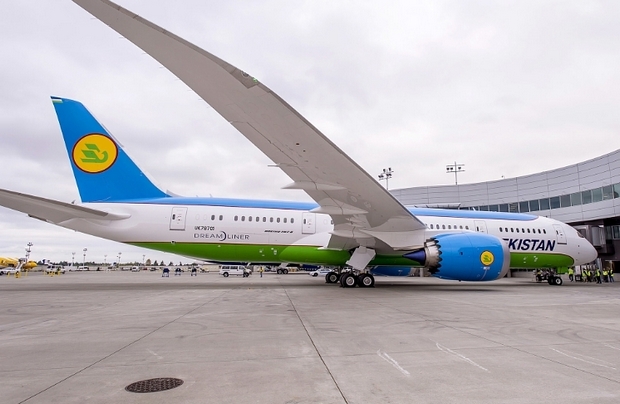 Uzbekistan Airways (HY), the flag carrier of the Republic of Uzbekistan, took delivery of its first Boeing 787-8 today. The new, GEnx-1B powered aircraft, tail number UK78701 (MSN 38363), will commence scheduled flights as early as September, HY says. It will be used on long haul international routes out of the airline’s hub in Uzbekistan’s capital city of Tashkent. The aircraft is capable of flying Tashkent to New York non-stop. As part of a fleet modernization program, Uzbekistan has ordered two 246-seat Boeing 787s. The second aircraft is scheduled for delivery later this year. “The delivery of our first Dreamliner marks a new and exciting chapter in our long-standing relationship with Boeing that began back in 1996,” said Valeriy Tyan, general director, Uzbekistan Airways. The airline is gearing up to support the aircraft in service. Earlier this year with the financial and technical support of Boeing, Uzbekistan Airways Technics, HY’s sister company, has launched a 787 MRO center to be used for repairs of composite elements of the Dreamliners. The Tashkent facility is the only one in the CIS capable of carrying out maintenance on the type. Uzbekistan Airways’ long-haul all-Boeing fleet consists of 16 aircraft — nine 767s and six 757s and now a 787. Besides, it operates Airbus A320 narrow-bodies and Ilyushin Il-114 regional turboprops. From its hub at Tashkent International Airport (TAS), the airline flies to more than 40 cities around the world. While Uzbeki national airline’s overall passenger traffic fell 4.7 per cent to 1.177 million passengers in first half of this year, the carrier’s international traffic as well as the number of flights to international destinations both grew within that period.